Did you know garbage disposals have been around since the 1930’s and that by 2009 roughly half of all households owned a garbage disposal? Even with its rise in popularity it is still considered one of the most misused appliances in the home. Disposals were designed to prevent food particles from clogging up your plumbing by shredding the food particles and combining with water to allow easy passage through pipes. The keywords here are food particles. 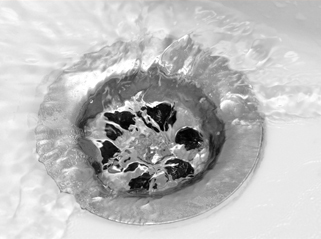 Large amounts of food can inundate the disposal possibly causing the motor to seize and clog your kitchen drain. If your kitchen drain is clogged and you need garbage disposal repair in Chandler, AZ call 4 Fathers Home Services and we will be happy to get your sink in proper working order for you. It’s inevitable that a foreign object will fall into your disposal and become lodged. In this instance, you can retrieve the foreign object by following these steps. 1. Turn OFF the power switch to the disposal and shine a flashlight into the kitchen drain to see if you can locate the object. 2. Remove the item using a pair of pliers, never stick your hand into the garbage disposal it is far too dangerous. If cannot retrieve the item call a reliable plumber to help safely remove the item from your disposal. Another common repair that you can make at home happens when the garbage disposal makes a humming noise but doesn’t work the way it should. Simply, try pushing the reset button that is usually found at the bottom of your disposal. Have a leaking disposal? The seal between the sink and the disposal may be corroded and in need of replacement. However, if the leak is at the bottom of the disposal then, unfortunately, you may need a new garbage disposal installed in Chandler, AZ. Whatever the issue may be, 4 Fathers Home Services is here for all your garbage disposal repair needs, give us a call today!